Official sales numbers are out for December and by all accounts the market looks in pretty good shape. Now that we have 12 months of data we can calculate year end sales numbers. I will say upfront my calculations differ from the Board of Realtors numbers. We’re both using the same numbers so I have a call into them to see how they’re calculating numbers. For the record, I don’t think it makes a whole lot of difference. 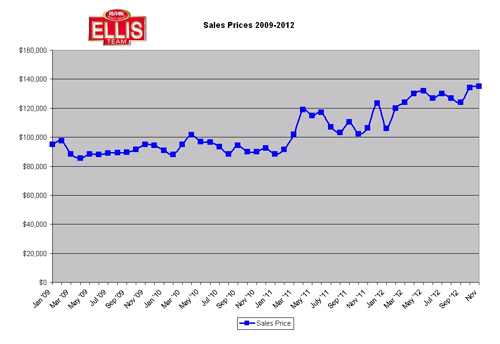 They are reporting, media sales prices rose 29.9% from $97,000 in 2011 to $126,000 in 2012. 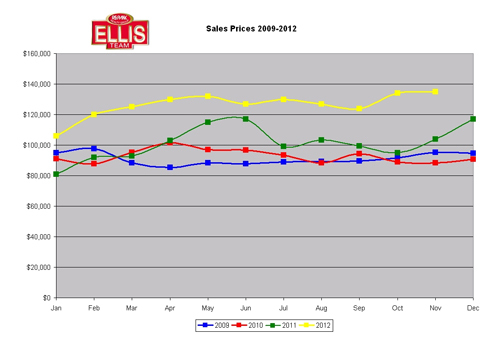 We are reporting sales prices rose 24.31% from $105,469 in 2011 to $131,108 in 2012. 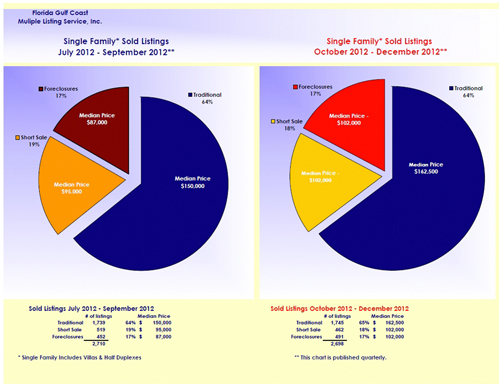 I used a methodology used by the Florida Association of Realtors. The Board must be using another methodology. I’m not saying either is right or wrong. In fact I have a call into the Board to look at their method, and if that method makes sense we may restate our numbers. Keep in mind both methods are based upon same set of monthly numbers so that’s not in doubt. The difference is in the calculations, and both tell a similar story. Another newly released chart I like to look at is the breakdown of traditional sales versus distresses sales and prices. While traditional sales remained at 64% for the 4th qtr of 2012, prices for those traditional sales rose $12,500 to $162,500. Foreclosure sales rose in price $15,000, and short sale prices rose $7,000 in the 4th qtr. Back in 2009 approximately 70% of all single family sales we distresses, and today that number is down to 36%. 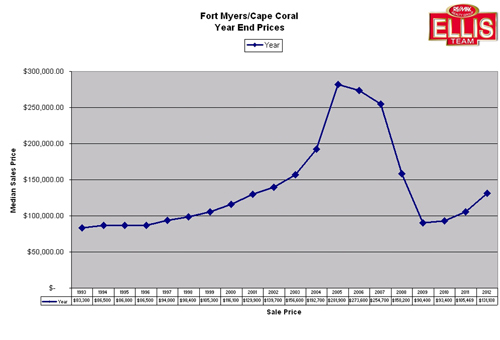 This is one reason we see rising prices, and as prices rise more and more SW Floridian’s can afford to sell. In quarters past we’d see price movement in one type of property but now we’re seeing it across the board. Inventory rose just about 400 homes in the 4th qtr however we’re still at a 4.0 month supply of homes on the market which is fairly low. Buyers coming for season will have a harder time finding properties and there will be more multiple offer situations. Look for 2013 to be the beginning of builders getting back into the market. Prices probably aren’t high enough for a full onslaught of building like we saw in the early 2000’s but we should see an uptick just the same. As we build more and as the economy improves the SW Florida real estate market is poised to takeoff. All the numbers line up for a market headed for much higher ground. The only variable holding us back is the overall economy. Once that improves, watch out. This market will be all green light Go. Buyers from up North have been buying the past year. They knew prices were headed higher and they’ve reacted. Buyers this year still have much opportunity ahead of them but prices are rising currently so the sooner you find your dream home the sooner you’ll lock in today’s prices. If you’re in a solid financial position to purchase I’d say buy now and then pray the economy improves versus the other way around. Waiting could really cost you money. If you’re a seller looking to trade out of your property keep in mind that as your property goes up in value so does the one you’re looking at buying. Talk to a real estate professional about your particular needs. 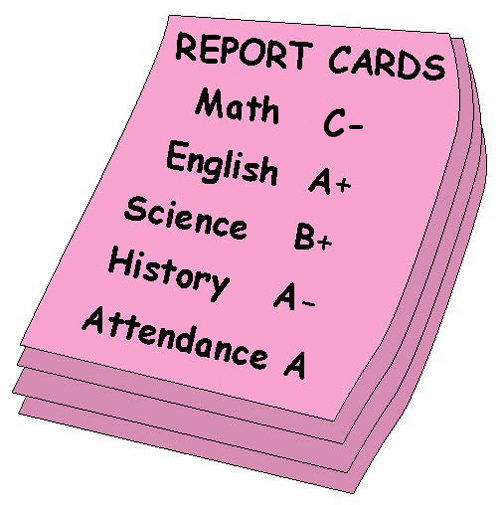 You can always call the Ellis Team at 239-489-4042 if you need help. January is one of my favorite months. Not only is January a new month, but it’s the beginning of a new year with fresh goals, resolutions, and outlook on the future. It also happens to be the month the CyberStars meet each year. Perhaps you’ve never heard of the CyberStars. They are a group of top producing agents who are on the cutting edge of technology and learn ways to apply those ideas and techniques to their already successful real estate practice benefiting their clients in any market conditions. The CyberStars are 225+ agents from the US, Canada, and as far away as Australia. I love attending the Summit held each year because the information shared is so incredible. For years the Ellis Team has innovated and brought new ideas to SW Florida, but one person or one team can’t know it all. Sure, we’ve gladly shared what we’ve developed with Realtors from across the country, and we do so with CyberStars as well. The real treat in attending this conference is it’s a chance to sit back and listen to what other innovative top producing agents are doing to help their clients. Believe me, if an idea works in California, Texas, or Australia, it’ll work in Florida. Sometimes we just need to get out of our little sandbox and see what the rest of the world is doing. This year on the 2nd day there is a session on using video in your real estate business. This is an advanced session and I’m excited to get some new ideas in this area. Most people locally know we produce a show on the Internet. It can be found at www.YouTube.com/brettellisfl It currently has about 108,000 views so anything we can do to add to the content and value to the public will benefit our team and the local real estate market. There is another section on Virtual Tours. Again, we do this and they can be found at www.TopAgent.com, but I’m thinking there will be some new and neat tips on bettering our tours. Mobile marketing is a big topic today as more buyers are using their mobile phones and tablets to search for properties. I’ll be teaching a session on this along with a few other agents, but I have a feeling I’ll be taking lots of notes as well. I believe mobile marketing is only going to get bigger and bigger and we want to lead, not follow if that’s where buyer’s eyeballs are headed. Social media is another topic we can all learn tips on. We use LinkedIn, Twitter, Facebook Fan Pages, our Blog, Pinterest, and several more. These are time consuming and I’m hoping to pick up tips on how to be more effective and more efficient with our social media strategy. In addition to 3 days of learning sometimes the best ideas are shared at lunch or dinner strategizing with other forward thinking agents. Sometimes I go out there with an idea and an agent points something out that would really improve that idea. It’s so nice to hang around agents who use technology and see the vision. These people are truly the creators and they love to share. A few weeks ago we provided preliminary statistics which suggested single family home prices in Lee County had risen to $135,000. Official numbers are out and the number is actually $137,000 which is an 11% rise over last year and a 2.24% rise over the previous month. 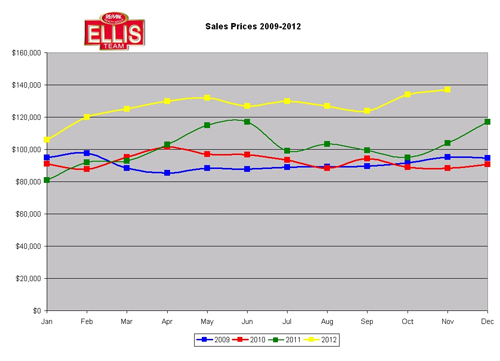 As you can see, prices have been rising in 2012 and the trend looks good heading into season. I thought it would be good to look inside the numbers just a bit and compare November 2012 with November 2011. As you can see, sales over $500,000 are roughly the same. Where we really notice a difference is in the $100-200k range and even more significantly in the 200-500k range. You’ll notice from the graph that foreclosure sales are down in both ranges and short sales are down in the higher range. The decrease in short sales and foreclosures combined with a dramatic increase in traditional sales is helping the market recover in price. The 11% increase in price is not surprising given the sales mix. One might look at the under $100k price range and notice the drop-off in sales and wonder if there is trouble in that market. The reality is there are less sales in that market because prices have risen and fewer homes fit into that market. Inventory under $100k is nothing like it was 3-4 years ago, so it’s impossible to pull those kinds of sales numbers from that price range because the inventory just doesn’t exist. After the height of the market in 2005 we watched home prices tumble and higher priced homes creeping back down to much lower price brackets. You can see from the graph we really started an upward trend in 2011 that continued in 2012. This will be good news for the county as tax assessments have been much lower forcing the county to cut budgets and spend from reserves. While there may still be some financial misery at the county level, it’s easy to see that price drops have abated and we are on our way back up which should help a bit. Rising prices will also help more homeowners sell their homes. Many have waited out the market in hopes prices would rise enough to cover their mortgage. We assume many home sellers would like to sell but just couldn’t due to prices relative to their mortgage amount. The rising market will help a certain number of sellers each year meet that goal. We’ve seen a large amount of investors and baby boomers buying second homes for retirement over the last few years. What’s been lacking are the locals who move up, down, and sideways. Consequently this has been an out of the area buying experience in large part. While we may not be quite there yet, we are getting closer to seeing locals up-sizing, down sizing, or trading lifestyles. Things change in life as kids grow up, move out, and sometimes back in with parents. Some people think they want a condo in a golf community only to change their mind later on and decide on a waterfront home where they can have their boat in the back yard. Some want space and privacy, while others decide they want a community with activities. People learn that what interests them today can change over time as people age, relationships change, and employment changes. Having a real estate market open up where less people are under water opens up new possibilities for many in SW Florida, and that is a change I’m sure many here welcome. As the market continues to improve I think we’ll begin to see more of that. We’ll also see more building which opens up more inventory, and more jobs. And if we can just get our national economy back on track, SW Florida could be in for some great times ahead. 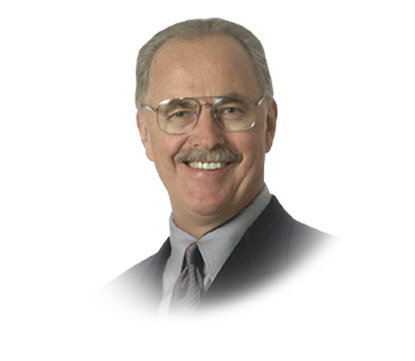 If you are in the real estate industry you were influenced by Howard Brinton whether you knew him or not. Howard was the founder of Star Power Systems, the most powerful training organization in the real estate industry. Real Estate Industry Loses a Legend! Howard was a top producing agent selling around 500 homes per year in his prime. Howard burst onto the scene nationally as an instructor for CRS (Certified Residential Specialist). Howard always believed success leaves clues so he set out to interview Top Agents throughout the country and identify what they did that worked. The Ellis Team attended sessions Howard did at national conventions, CRS classes, and Star Power conferences. The information Howard and the Stars shared worked. It was proven on the street. The Ellis Team was so influenced by Howard and the Stars over the years that brought back many of the ideas to SW Florida. The Ellis Team was the first true real estate team in SW Florida. Many agents worked as loose partnerships, but none as a true team until Howard taught the systems to make it work. We ran an ad in the early 90’s that we picked up from Star Power that read “By the Year 2010 All Agents Will Operate as a Team .” This was quite controversial in its day, and many agents called up and complained. Several years later teams spread across the country and a large volume of business was handled by teams. Not every agent works as a team, but Howard sure changed the landscape. Howard also taught Realtors how to effectively price homes, answer objections, and how to listen to uncover needs. He called it “Going 3 Deep.” I hear agents complain “Buyers are liars.” Howard taught us they’re not liars, you just didn’t ask enough questions. Buyers will tell you everything you need to know if you just ask the right questions and listen. 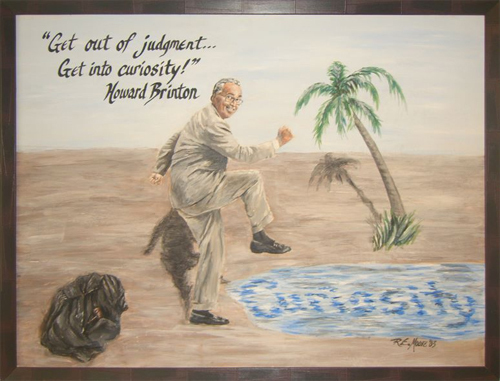 Howard taught us the concept of getting out of judgment and into curiosity. I recall hearing ideas early in my career and thinking, “I can’t do that, or that won’t work in my market.” The truth is, those were judgment statements. By suspending judgment we learn to listen and say “What if?” If we stay in curiosity chances are more answers will come to us than if we just dismiss them at first glance. We were fortunate to grow and become a top team in the country because of Howard. 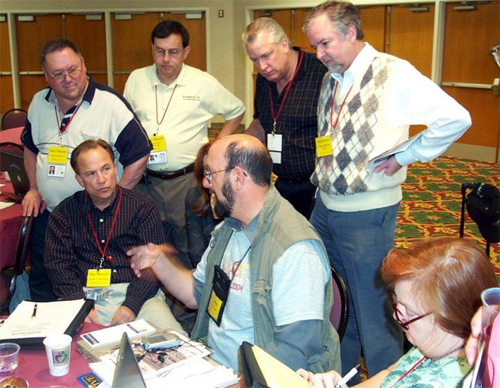 In 2001 Howard asked us to become a Star and share our knowledge with Realtors across the world. It was truly an honor. A few years later Denny Grimes was selected to become a Star based upon many practices he put into place from Star Power. When you went to a Star Power conference you’d hear ideas coming at you a mile a minute, almost as if it was shot out of a fire house. You couldn’t implement all of them at once, but you knew if you didn’t, someone else at the conference would. The Ellis Team was the first in SW Florida to incorporate many things, but not everything. Denny actually beat us to the punch with a moving truck for clients, an idea presented at Star Power. This is why I say even if you never heard of Howard you were influenced by him because you were either implementing ideas or your competition was and you were forced to react. We know that by sharing our ideas to Realtors across the world that many would be copied here locally, but that’s OK. Howard always said, you can innovate faster than people can copy, and most people won’t copy all your ideas anyway out of fear. Many ideas cost money, and we had the vision because of Star Power to know the idea would work. People copying didn’t have that vision, they only saw what you were doing. One page isn’t nearly enough to describe Howard. He was generous, a leader, humorous, and a true friend. We’re so privileged to have known him and worked with him. Whether you knew Howard or not, please say a little prayer for his family. Chances are Howard paved the way and made your work or personal life better because of his ideas, and to that we can all be thankful. God reclaimed a good one. I’m sure he was needed up there. And I’m sure he has them laughing and learning! Sellers around SW Florida should be happy. Actually buyers should be too, which is a rare thing indeed. Official numbers weren’t released as scheduled due to the holiday week, so we ran our own numbers which should be pretty close. Once official numbers are out we’ll revise our charts to reflect official data, but in the meantime we’ll analyze why people should be happy in SW Florida. As you can see, median single family home prices in SW Florida continued their upward trend in 2012, rising to $135,000 in November. Each month traditional sales have risen which means less percentages of distressed sales. Sellers will like this because not only are prices rising, but more people can afford to sell with the rising prices without having to sell as a short sale or foreclosure. Buyers surely love this market as well. More traditional sales means less buyers have to wait months and months for an answer on a short sale. That’s always a scary proposition because market inventory is light anyway. It’s never fun to have a bid in on a house waiting patiently for an answer from the seller’s bank while more homes come and go on the market, never knowing exactly what the bank will do with your offer. Buyers are also happy with prices. Sure, they’re not at their lows in 2009-2010, but many buyers didn’t buy back then anyway because they were afraid it wasn’t the bottom. Investors propped up the market back then and bought most of the homes traditional buyers were afraid to buy. Regular buyers rarely purchase at the bottom because they’re too afraid prices might dip lower. Rising prices prompt buyers to say “Darn, we missed the bottom, but we better jump in now before things go higher. We can still get a good deal.” Buyers actually like the confidence of knowing other buyers feel strongly about the market too. It’s called the herd mentality, and it’s true on Main Street and Wall Street. So buyers have their confidence. They also have very low interest rates. Home affordability is high which means buyers have purchasing power. Heading into the New Year we have a wish list for the SW Florida real estate market. They won’t all come true, but we can wish can’t we? We don’t control many of these factors here locally. If by chance we were able to do several things on this list, the local SW Florida real estate market is poised to take off like a jet. Our market has seen some pain over the years and has been recovering nicely. We are starting to see the fruits of that recovery this past year or more. How fast this jet takes off is due in large measure to how fast we address the 6 issues. So sit back and enjoy the fruits of our market, and with any external luck, those fruits could turn into treats. Here’s to a great New Year to your family from ours!!!! Cheer Cheer!